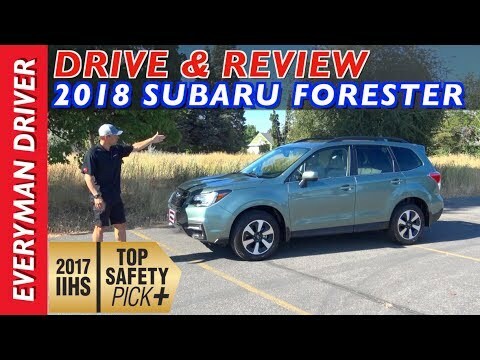 The 2018 Subaru Forester is one of over a dozen compact-crossover SUVs vying for your attention, but it's the only one with standard all-wheel drive. That trait has long made Subarus the favored vehicles of cold-weather states, while the Forester's ample ground clearance and ability to venture off-pavement have made it popular with the adventure-minded. This is our third forester, the first being in 1998 the year the forester came out. I can attest that the carpeting and material used on the seats in the base model was far better than what you get now. We had fog lights standard, no longer so. With our 2018 we lost one of the holders for sunglasses, and 3 of the directional tabs for the vents broke off before the first oil change. it also takes far longer to warm up in the winter than the 2 previous models did and the pick-up also feels reduced. The trunk is not as deep, when you put the back seats up the strip that is supposed to be snapped in and glide up behind the seats buckles and needs to be reset. the tarp above the trunk area is not at all simple with the addition of a strip between the back seats and the bar that has stretch ties that go over the headrests. not easy to quickly remove. If you are moving furniture, as we just recently had to do, it is difficult to slide anything into the back, it gets caught on the strip between the folded seats n trunk its so so very uneven that you have to pad the trunk area to level the space - ok if you're moving 1 thing - not ok if you are moving and need to pack more than 1 piece of furniture and other belongings. The seats are, amazingly, even more uncomfortable than the 2006 Forester we had making longer trips difficult. It does handle as well as the other Foresters we had, and the engine change should probably end the suicidal head gasket which both the 1998 and 2006 experienced at 79k n 100k respectively (the latter due to additives in the oil to extend the life of the gasket). unhappy with the vibration of the rear view mirror which is now attached to the windshield instead of the ceiling and moves when the radio is on. The ride is not as loud as the 2006 was, however, the 2006 increased in rattling noise as it aged. Aside from the backup screen which I do like, the touch screen radio is not so great and more of a distraction. I'm sure its going to be a wonder of electronic mishaps for the future. My 2006 had a shorting sensor for the doors which was placed behind the grill on the drivers side. It happily locked me out of the car on rainy days when I'd get out to check the mailbox, took a bit to figure out it wasn't possessed. I am pretty sure this will be our last Forester. My husband has been the driving factor in our purchase of this model based on the all wheel drive and safety features. Im sure there will be more all wheel drive choices in the future from companies other than Subaru. Great buy would recommend to family and friends. I like the Forester because it has a smooth ride, spacious interior, great visibility and good in the snow and ice. The back trunk has a lot of room for groceries. The color white is fresh and bright. The only negative I would say is that the interior is a bit noisy as you drive on the freeway. It sounds like your windows are open even when they are not open. The seats are not that comfortable. I find the monthly lease payments affordable. If you live in a region that has a lot of snow I would recommend this SUV. Many people in my area have the same car which can sometimes make it hard to find my car in public places. .
My Subaru. The coating on the paint last the life of the vehicle. Smooth ride, extremely comfortable, what I like the most is you do not hear the wind sounds it is a quiet ride. I owned a 2014 and never had 1 problem with it I only traded it because I wanted a newer SUV. Got a very large trade in value. I would highly recommend this vehicle 1st for its safety and for it is dependability. No blind spots l love that, I have not had any mechanical issues with either SUV so I can only praise the vehicle for its performance. Good looks, interior on 2014 like new, non yellowing headlights, lots of legroom front and back seats. Take it for a ride, you will love it.